“The time to plan for the future and inevitable acquisition is now,” Batenburg, the author of Change Is Great: Be First! stressed. Batenburg recalled how overbuilders in cable’s “wide open West” came in and talked counties to plant in the ground. That kind of lobbying begins at the local level, and we’re seeing that today in the way licensing is being administered across legal cannabis states. The enterprise arms of each company used conflicting platforms for online payments and billing, and complicated product sets and other inefficiencies have made the merger a challenge on the back end. And herein is the crux of Batenburg’s foreshadowing: Plan for the future. “Have a unique operational and cultural advantage,” Batenburg stressed. As a seasoned expert at building end-to-end processes to help front line employees deliver products and services to customers, he’s been able to bring this mindset to the cannabis companies he works with. “Cannabis, unlike cable, will not be able to play host to smaller providers in remote, less-populated areas like Nebraska, the Dakotas, and Kansas,” Batenburg explained. There’s simply no sustainability to it. “Cannabis companies must ask themselves, ‘If we grow 200%, and buy more space, machines, and facilities, does the system, processes, and culture scale to accommodate this?’,” Batenburg suggested. Cable companies didn’t do that well, and right now, most cannabis companies aren’t either. “To be successful in the long haul, cannabis businesses need to be consciously developing systems, processes, and culture that are optimized and can be scalable,” Batenburg stressed. The cannabis industry has an opportunity to set the stage for a successful national rollout today. 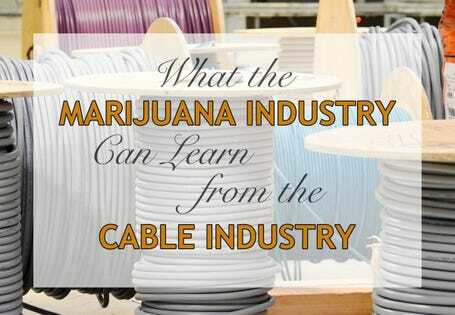 With foresight on the part of companies and industry advocates, cannabis can avoid many of the headaches that have plagued the cable industry. It’s never before been more important for cannabis businesses to systematize their processes, procedures, and culture with the goal to always be attractive to an acquirer.